One word has the power to transform our usually peaceful pack – just one word, even if it is only whispered. Say the word ‘treat’ in this house and all hell breaks loose. Canines converge on us from every angle at breakneck speed as the cat scrambles for cover and we cringe, anticipating the onslaught. The keeper of treats (the one who opens the jar) has a hazardous job in our household – not only is proper distribution essential: traffic management and theft prevention are important aspects to consider when a number of large dogs approach with haste and jockey for position in an attempt to get the upper hand, or in this case, paw. They can’t help themselves, and we really don’t mind. But it’s not unlike watching a number of clowns pouring out of an impossibly small car when the pack bears down on you. They ham it up, smile, dance in place, sit and beg. Our dogs are total nuts for treats. And we love treating them! Speaking of treats, our food sponsor has just launched a new line of dental chews. Dental Chews Fresh & Clean formula is available in three sizes: medium, small and mini. 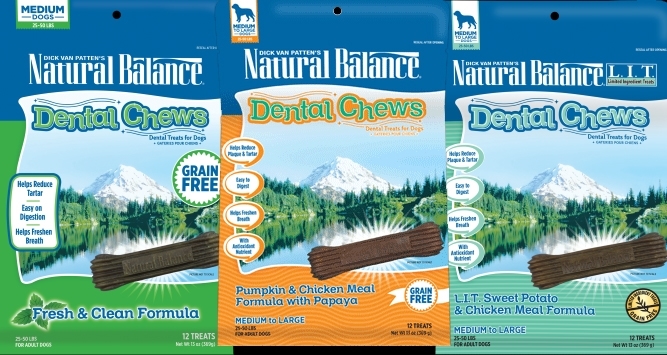 Natural Balance Dental Chews are scientifically formulated to support healthy teeth and gums by encouraging your dog’s natural chewing instinct. Made with premium ingredients, these grain-free chews offer a delicious mix of flavors that your dog will love – ours certainly do! So readers, do tell – what is the magic word that brings out the natural character in your dog?